High quality for our products and systems is a requirement that is driven and supported from the Management Team and flows every day throughout the organization. Quality as a philosophy and discipline begins on the Manufacturing Floor with each of our Team Members having equal responsibility and accountability for the quality of our products and our business. Our Quality Policy states that we are committed to provide products and services which will exceed our customers' expectations. The Main & Company Quality lab is environmentally controlled and includes all standard mechanical measurement devices (such as micrometers, vernier calipers, plug gages, optical comparators, thread gauging, ring and plug gages, tri-rolls and segments and surface finish measuring equipment). 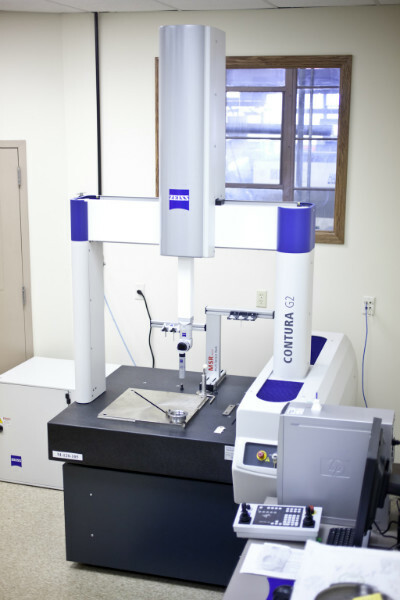 Our capabilities feature two state of the art DCC Coordinate Measuring Machines (Zeiss & Mitutoyo / Renishaw), both equipped with scanning head technology for increased accuracy and reliability. 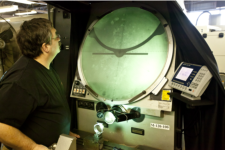 Our management team, technicians and machinists combined have years of valuable machining, inspection and layout experience in multiple product disciplines, providing an extensive knowledge base and practical approach to quality applications for our customers. Since 2007, our Quality Management System has achieved certification as a "Manufacturer of Precision Machined Components and Assemblies". In 1962, Main & Company developed a Quality Management System built around the MIL-Q-9858 standard. 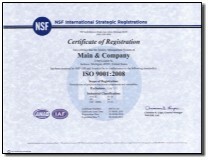 This has been the building block for our current AS9100 and ISO certifications. 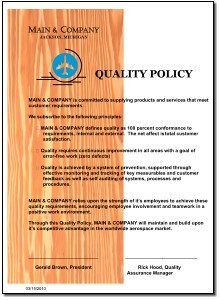 More importantly, it reflects a commitment to Quality that is committed to and has been practiced every day for more than fifty years at Main & Company. Quality is critical at Main & Company as we have developed a niche for producing parts with complex configurations that are also difficult to measure and validate. Although we have always relied on solid fundamental measurement methods we realize that our customers' requirements have become ever more stringent. We have led the way by incorporating state-of-the-art measurement machinery and techniques to improve our capabilities through expansion of our facilities, resources and employee talent. We are committed to continually study, dissect and rebuild processes for improved performance and greater adherence to our customers' requirements. Main & Company has made it our business to provide our customers with the best quality and value and will continue to improve our quality processes to keep meeting our customers' expectations.